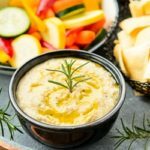 Rosemary white bean dip is an easy to make appetizer for entertaining or tailgating. Serve it with vegetable crudites, pita chips, or crackers. Place all ingredients except sprigs in the bowl of a food processor fitted with a knife blade. Process until smooth. Stop and scrape down sides as needed. Transfer dip to a serving bowl. Lightly drizzle olive oil on top. Garnish with rosemary sprigs. Best when made a couple of hours prior to serving. Serve with vegetables, pita chips, sliced baguette, or crostini.